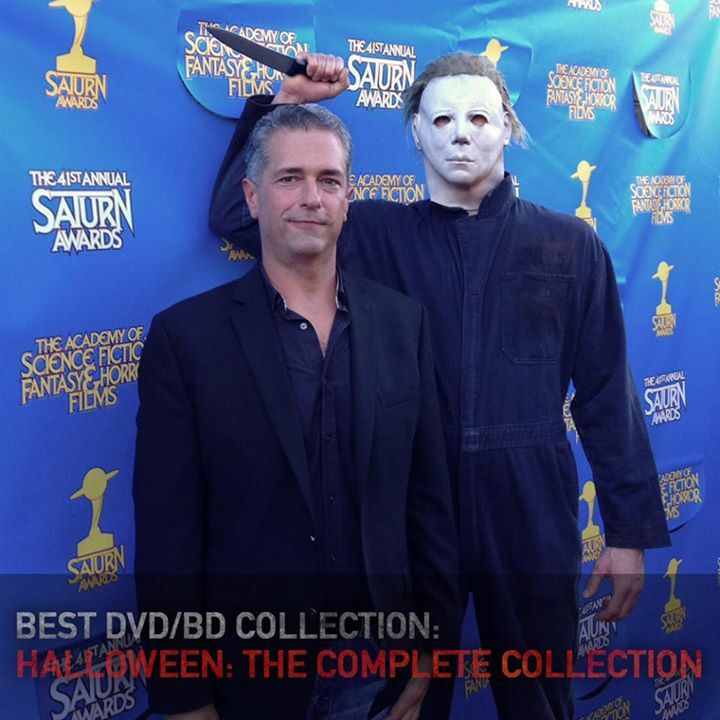 Last year’s landmark 15-disc release from Anchor Bay and Scream Factory of Halloween: The Complete Collection won the award for Best DVD/BD Collection Release at the 41st Annual Saturn Awards, presented during a ceremony held last night (June 25) in Beverly Hills. Halloween franchise producer Malek Akkad is pictured above, along with a familiar Shape, on the red carpet of the 2015 Saturn Awards. 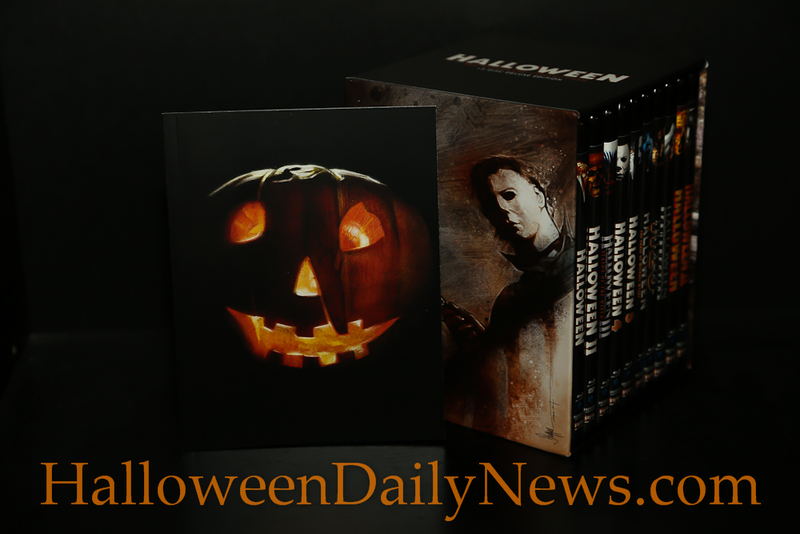 Read on for the full press release, and then click here for our review of Halloween: The Complete Collection! Four years after the Saturn Awards were born, an indie horror film was released that would transform the genre. The 1978 John Carpenter terror classic, Halloween, was the beginning of one of the most durable, iconic and copiously studied horror franchises ever created. Ten films and over three decades later, Anchor Bay Entertainment and Scream Factory released the entire collection on Blu-ray™. Last evening, the Academy of Science Fiction, Fantasy and Horror Films awarded the Halloween Complete Collection with the Saturn Award for Best DVD/BD Collection release. Malek Akkad, son of the original film’s producer Moustapha Akkad and producer of the next installment of Halloween, accepted the honor. The event was held at the Castaway in Burbank, California and attended by an audience of over 600 attendees. The release was amidst a field of stellar releases including The Exorcist: The Complete Anthology, Stanley Kubrick: The Masterpiece Collection, Steven Spielberg Director’s Collection, Toho Godzilla Collection and Universal Classic Monsters: Complete 30 Film Collection.The Academy of Science Fiction, Fantasy and Horror Films was founded in 1972 by Dr. Donald A. Reed to recognize and honor excellence among filmmakers in the science fiction, fantasy, horror and action/adventure/thriller genres. In a historic partnership with Scream Factory, the Halloween Complete Collection Blu-ray™ presents all the films in the iconic Halloween film franchise in a single package – all 10 films packaged together for the first time, including the newly restored Halloween: The Curse of Michael Myers Producers Cut, the Halloween 35th Anniversary Edition, the two Rob Zombie films, and hours of NEW bonus features that will thrill fans of the legendary franchise and fans of modern horror cinema.